Looking forward to some R&R this Ramadan 2018? From unbeatable discounts to incredible packages, unwind (and save money!) 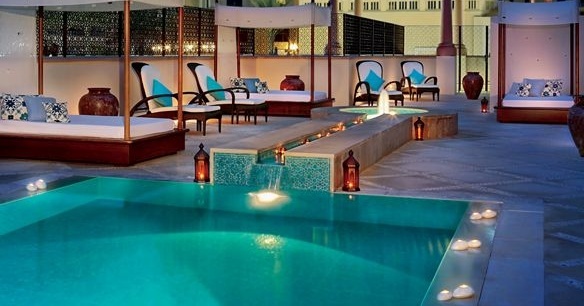 with these awesome Ramadan spa deals in Dubai. Staying true to its Middle Eastern roots, Saray Spa uses traditional ingredients such as honey and yoghurt in its massages, along with the aromatic fragrances of olive oil and sandalwood. Make the most of the spa’s Ramadan Special and enjoy an unbeatable discount on all massages on weekdays. Enjoy 50% off on any massage between Sunday to Wednesday, from 9am to 2pm. The offer is valid until 31st August 2018. Embracing the principles of ancient Eastern philosophies, CHI, The Spa at Shangri-La Hotel focuses on the spiritual and physical well-being of all its world-weary guests. The spa’s Ramadan deal is one not to miss; it includes a 60-minute aromatherapy massage or a 60-minute deep tissue massage for an amazing price. Embark on a Sensory Journey this Ramadan and enjoy an incredible spa experience at The Ritz-Carlton Spa in DIFC. This special Ramadan package includes back exfoliation, heat packs to relieve tension in muscles, and a full body massage. The best part? You’ll also receive a AED 200 discount voucher on your next visit. Located in the luxurious H Hotel, the award-winning Mandara Spa offers five-star treatment to guests in need of serious de-stressing. Make the most of 50% discounts on weekdays and 40% discounts on weekends, along with complimentary pool access before or after your treatment. Ahasees Spa & Club at Grand Hyatt Dubai is the perfect setting to chase the stress away, complete with an outdoor pool, steam room, sauna and Jacuzzi. This Ramadan, make the most of the spa’s awesome Ramadan offer which includes your choice of either an Essential Body Polish or Hyaluronic Face Massage, followed by a Hydrating Body Massage, and deep hydrating and moisturising balm. All treatments are available throughout May and June. Read More: Check out insydo’s Look Good category for more pampering treats, including the best massages and facials in Dubai!